The carpal tunnel is an area in the wrist where the bones and ligaments create a small passageway for the median nerve. The median nerve is responsible for both sensation and movement in the hand, in particular the thumb and first three fingers. When the median nerve is compressed, an individual's hand will feel as if it has "gone to sleep." Women between the ages of 30 and 60 have the highest rates of carpal tunnel syndrome. Research has demonstrated that carpal tunnel syndrome is a very significant cause of missed work days due to pain. In 1995, about $270 million was spent on sick days taken for pain from repetitive motion injuries. Compression of the median nerve in the wrist can occur during a number of different conditions, particularly those conditions which lead to changes in fluid accumulation throughout the body. Because the area of the wrist through which the median nerve passes is very narrow, any swelling in the area will lead to pressure on the median nerve. This pressure will ultimately interfere with the nerve's ability to function normally. Pregnancy, obesity, arthritis, certain thyroid conditions, diabetes, and certain pituitary abnormalities all predispose to carpal tunnel syndrome. Other conditions which increase the risk for carpal tunnel syndrome include some forms of arthritis and various injuries to the arm and wrist (including fractures, sprains, and dislocations). Furthermore, activities which cause an individual to repeatedly bend the wrist inward toward the forearm can predispose to carpal tunnel syndrome. Certain jobs which require repeated strong wrist motions carry a relatively high risk of carpal tunnel syndrome. Injuries of this type are referred to as "repetitive motion" injuries, and are more frequent among secretaries doing a lot of typing, people working at computer keyboards or cash registers, factory workers, and some musicians. The most severe cases of carpal tunnel syndrome may require surgery to decrease the compression of the median nerve and restore its normal function. This procedure involves severing the ligament that crosses the wrist, thus allowing the median nerve more room and decreasing compression. result in permanent weakness, loss of sensation, or even paralysis of the thumb and fingers of the affected hand. The diagnosis of carpal tunnel syndrome is made in part by checking to see whether the patient's symptoms can be brought on by holding his or her hand in position with wrist bent for about a minute. Wrist x rays are often taken to rule out the possibility of a tumor causing pressure on the median nerve. A physician examining a patient suspected of having carpal tunnel syndrome will perform a variety of simple tests to measure muscle strength and sensation in the affected hand and arm. Further testing might include electromyographic or nerve conduction velocity testing to determine the exact severity of nerve damage. These tests involve stimulating the median nerve with electricity and measuring the resulting speed and strength of the muscle response, as well as recording speed of nerve transmission across the carpal tunnel. Carpal tunnel syndrome is initially treated with splints, which support the wrist and prevent it from flexing inward into the position which exacerbates median nerve compression. Some people get significant relief by wearing such splints to sleep at night, while others will need to wear the splints all day, especially if they are performing jobs which stress the wrist. Ibuprofen or other nonsteroidal anti-inflammatory drugs may be prescribed to decrease pain and swelling. When carpal tunnel syndrome is more advanced, injection of steroids into the wrist to decrease inflammation may be necessary. The most severe cases of carpal tunnel syndrome may require surgery to decrease the compression of the median nerve and restore its normal function. Such a repair involves cutting that ligament which crosses the wrist, thus allowing the median nerve more room and decreasing compression. This surgery is done almost exclusively on an outpatient basis and is often performed without the patient having to be made unconscious. Careful injection of numbing medicines (local anesthesia) or nerve blocks (the injection of anesthetics directly into the nerve) create sufficient numbness to allow the surgery to be performed painlessly, without the risks associated with general anesthesia. Recovery from this type of surgery is usually quick and without complications. Without treatment, continued pressure on the median nerve puts an individual at risk for permanent disability in the affected hand. Most people are able to control the symptoms of carpal tunnel syndrome with splinting and anti-inflammatory agents. For those who go on to require surgery, about 95% will have complete cessation of symptoms. Prevention is generally aimed at becoming aware of the repetitive motions which one must make which could put the wrist into a bent position. People who must work long hours at a computer keyboard, for example, may need to take advantage of recent advances in "ergonomics," which try to position the keyboard and computer components in a way that increases efficiency and decreases stress. Early use of a splint may also be helpful for people whose jobs increase the risk of carpal tunnel syndrome. Seiler, John Gray. "Carpal Tunnel Syndrome: Update on Diagnostic Testing and Treatment Options." Consultant 37, no. 5 (May 1997): 1233. Carpal tunnel — A passageway in the wrist, created by the bones and ligaments of the wrist, through which the median nerve passes. Electromyography — A type of test in which a nerve's function is tested by stimulating a nerve with electricity, and then measuring the speed and strength of the corresponding muscle's response. Median nerve — A nerve which runs through the wrist and into the hand. It provides sensation and some movement to the hand, the thumb, the index finger, the middle finger, and half of the ring finger. the most common nerve entrapment syndrome, characterized by paresthesias, typically nocturnal, and sometimes sensory loss and wasting in the median nerve distribution in the hand; often bilateral and affects women more than men; due to chronic entrapment of the median nerve at the wrist within the carpal tunnel. a common painful disorder of the wrist and hand, caused by compression on the median nerve between the inelastic carpal ligament and other structures within the carpal tunnel. It is often seen in cumulative trauma to the wrist. Symptoms may result from trauma, synovitis, or tumor or may develop with rheumatoid arthritis, amyloidosis, acromegaly, or diabetes. The median nerve innervates the palm and the radial side of the hand; compression of the nerve causes weakness, pain with opposition of the thumb, and burning, tingling, or aching, sometimes radiating to the forearm and shoulder joint. Weakness and atrophy of muscles may increase from lack of use, as a result of pain that impairs thumb and finger dexterity. Pain may be intermittent or constant and is often most intense at night. Diagnosis can be confirmed by electromyography. Symptomatic treatment usually relieves mild symptoms of recent onset, but if the pain becomes disabling, the injection of corticosteroids often yields dramatic relief. Surgical division of the volar carpal ligament to relieve nerve pressure is usually curative. A common nerve entrapment syndrome, characterized by hand paresthesia and pain, and sometimes sensory loss and wasting of muscle in the median nerve distribution; caused by entrapment of the median nerve at the wrist, within the carpal tunnel. The result of any swelling occurring within the CARPAL TUNNEL. There is compression of the median nerve causing pain, numbness and tingling in one half of the hand, on the thumb side. The condition is commonest in middle aged women and may require injections of steroids or surgical decompression. Ultrasound treatment has also been used. 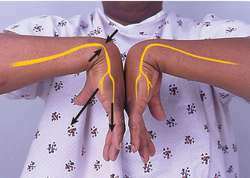 nocturnal pain, numbness, weakness of the thumb and tingling in the area of distribution of the median nerve in the hand. Due to compression of the nerve as it passes under the fascial band on the front of the wrist. Most common in middle-aged women. 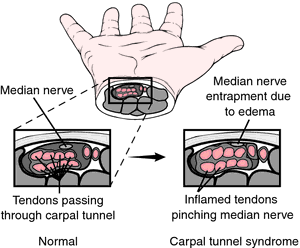 Most common nerve entrapment syndrome, characterized by sensory loss and wasting in the median nerve distribution in the hand; due to chronic entrapment of median nerve at wrist within carpal tunnel. n an irritation and inflammation of the synovials surrounding the tendons controlling the fingers. It is a disabling condition for persons who work with their hands, particularly those engaging in keyboard activities, data management, and instrumentation such as those in the dental office. Histology of the transverse carpal ligament and flexor tenosynovium in idiopathic carpal tunnel syndrome. False positive electrodiagnostic tests in carpal tunnel syndrome. A selfadministered questionnaire for the assessment of severity of symptoms and functional status in carpal tunnel syndrome. Long-term symptom outcomes of carpal tunnel syndrome and its treatment. Impact of occupa tion and job tasks on the prevalence of carpal tunnel syndrome. If you develop symptoms of carpal tunnel syndrome, Dr. Absenteeism related to carpal tunnel syndrome is a big concern," she said.